The sixth generation Apple Airport Extreme Base Station (6th Generation) features simultaneous dual-band 802.11ac Wi-Fi support to transmit at both the 2.4GHz and 5GHz frequencies at the same time. It gives luxury of worriless connectivity, no matter which band wireless devices use; theyll automatically connect to the best available band for the fastest possible performance. The Airport Extreme Base Station can reach data rates of up to 1.3Gbps with three-stream 802.11ac technology, which is triple the 802.11n standard. 802.11ac Wi-Fi also provides double the channel bandwidth with 80MHz-wide channels providing more room for data to flow faster. 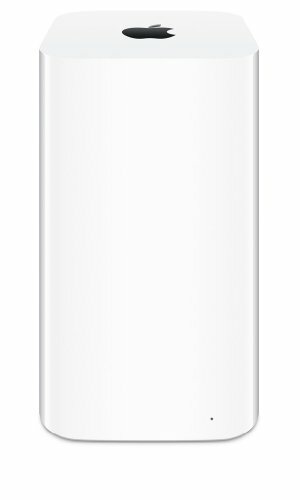 For the all-new design of AirPort Extreme, Apple took an approach that centered around performance and made it taller and put the antennas at the top, creating a higher platform for dispersing the signal. We also increased the number of antennas. There are now six of them — three for the 2.4GHz band and three for the 5GHz band. Together with 802.11ac wireless technology, they let you connect faster, farther, and with more power than ever before. The bar for Wi‑Fi base stations has been raised.